In need of entertainment for the big kids? If so please take a look above at our 18X18 balloons theme inflatable (images of balloons ect...). 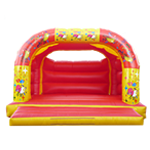 This bouncy castle has extra high walls for adult safety and comes complete with a shower cover. We will deliver between 9am and 12pm and collect between 6pm and 9pm. If you have a specific time please indicate this in the additional comments section of your order. We will try our best to meet your requirements. Failure to provide identification will result in a termination of booking. NO OTHER FORMS OF IDENTIFICATION ARE ACCEPTABLE.